Sometimes there’s no explaining how a person manages to work his or her way into your heart. It just happens. 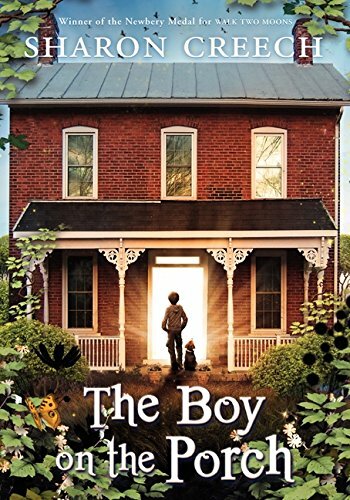 In author Sharon Creech’s latest middle grade novel called The Boy on the Porch, a childless couple discovers an abandoned five- or six-year old (they’re never sure which) on their porch with a brief note explaining how someone will return for him. The boy—Jacob—is mute and defenseless, and with nothing to go on except the fact that he needs their protection, the couple make room for him. This selfless act changes their world. They quickly discover that Jacob’s muteness is a handicap only to those without an open mind. The boy can paint startling abstracts, communicate with animals on an almost otherworldly level, and play the drum and the guitar beautifully—without ever having had lessons of any kind. Every day is a quiet explosion of joy as Jacob celebrates life in his silent way. And every day, the childless couple’s world expands a little more. They begin to talk to each other on a deeper level than usual. They think outside of their isolated box. They even make the startling discovery that despite their long years together, they do not, in fact, know each other as well as they once thought. As time passes and no one returns for Jacob as promised, the couple bond with him even more. He brings out the “child” in each of them; he conjures old childhood memories long forgotten. Through him, they relive the joyous unpredictability of childhood, and they simply cannot imagine their world without him. But like all other good things that eventually come to an end, their time with Jacob is over too quickly. His father returns to claim him, and there is nothing they can do to hold onto him. Now they must decide: Should they return to the familiarity of their empty, isolated, unidimensional lives? Or should they dare to open their hearts and home and invite more children in? The Boy on the Porch is a quiet and oddly beautiful book about the wonder of youth, the rewards of self-sacrifice, and the beauty of unconditional love. The prose is stark and almost as empty as the couple’s lives before Jacob appears on the scene. Yet the bare bones prose cannot prevent these lonely characters from working their way into the reader’s heart the same way Jacob worked his way into the couple’s hearts.